I have written my last holiday card for Lafayette Printing Company. Graphic designer, Natalie Powell, and I have created a holiday card for Lafayette Printing since 1991—the year my first son, Jack, was born. Each card has featured a local person, place or entity. 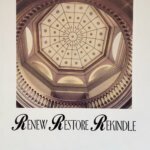 The first card we produced highlighted the gorgeous interior of the Tippecanoe County Courthouse dome, as the building was undergoing renovation that year. Fast forward to 2017, and the courthouse dome is once again under renovation. The 25th holiday card written by Angie Klink and designed by Natalie Powell for Lafayette Printing Company. First holiday card created by Angie Klink and Natalie Powell in 1991 for Lafayette Printing Company. 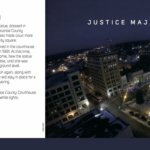 It is fitting that we would bookend our quarter of a century of work by featuring the courthouse on the first and last cards in our series, for the courthouse is the distinguishing mark of the Lafayette Printing logo. Jack, now a professional videographer, was born just four months before I created my first Lafayette Printing holiday card. This year, the photo he took from his drone graces the cover. What goes around comes around. The Lafayette Printing Holiday Card has been an enjoyable, creative privilege for which I am grateful. We have chosen to go out as we came in—on top— with the dome and its statue of Justice, a wise and tranquil countenance.